ISwitch Design proud to offer you; Konoq touch switches. Its outstanding quality, exquisite modern design and chic finish will bring aesthetic to your desired home. Our variety of stock, wide colour options and UK based customer service will give you the service you deserve. 1 gang 2 way Dimmer & on/off Touch White Switch. The single switch with one button, which controls single light (or lighting circuit). It allows user to turn the light On/Off as well as dim the light by touch. Konoq Switch`s Features and Benefits. All our switches are manufactured in accordance with European and British Standard and CE, ROHS and FCC Certified. 2 Years of manufacturing guarantee and 12 years quality maintenance as standard. Ultra thin design, finished with high quality tempered crystal glass panel. All our switches are made as Waterproof and Fireproof to give you peace of mind function of preventing electrical shock, which allows wet hand operation. Capacitive touch panel (like touch screen mobile phones) with night light indicator. Suitable for; Incandescent Lamp, Energy Saving Lamp, LED Lamp, Fluorescent Lamp. Easy to clean, luxury glass design will always look as brand new. Use relay load; No flickering, No buzzing noise. Comes in White, Black or Gold finish to match your home style. Konoq Switches are supported with 1.35mm iron frame back, which is more robust against; shape change, crack down, interference problems compare to plastic/dissolved silicon units. Number of switch button on panel, options are 1, 2 or 3 gang. Same light can be controlled more than one switch, options are 1 or 2 way. Touch On / Off Switch. It allows user to turn the light On/Off by touch. Dimmer Touch On / Off Switch. Remote Touch On / Off Switch. It allows user to turn the light On/Off by touch as well as with remote control. Remote Dimmer Touch On / Off Switch. It allows user to turn the light On/Off as well as dim the light by touch or remote control. RM Pro BroadLink (Wifi & 4G Control). It allows user to turn the light On/Off as well as dim the light by any device with wifi or 4G compatibility. Dimmer switches will only work with dimmable lights. LED lights bulbs less than 3 Watts will require LED capacitor adapters which can be provided upon request. Konoq 2 way switches will only synchronize with another Konoq switch. 1 gang / 2 Way. 86 x 86 x 35 mm. > 100.000 on/off times. 3 - 800 W/gang, < 2000 W Total. No need to change wiring, can be installed on existing wiring. Please note; we would recommend all our products to be installed by certified electrician. This is both for your safety and the proper use of the switch. CHANNEL ISLANDS, ISLE OF WIGHT, ISLE OF MAN, SCILLY ISLES, SCOTTISH HIGHLANDS, SCOTTISH ISLANDS, NORTHERN IRELAND. 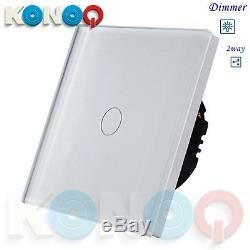 The item "KONOQ Luxury Glass Panel Touch LED Light Smart Switch DIMMER, White, 1Gang/2Way" is in sale since Saturday, July 01, 2017. This item is in the category "Home, Furniture & DIY\Lighting\Light Fittings". The seller is "konoq" and is located in London. This item can be shipped to United Kingdom, Austria, Belgium, Bulgaria, Croatia, Cyprus, Czech republic, Denmark, Estonia, Finland, France, Germany, Greece, Hungary, Ireland, Italy, Latvia, Lithuania, Luxembourg, Malta, Netherlands, Poland, Portugal, Romania, Slovakia, Slovenia, Spain, Sweden, Australia, United States, Russian federation, Canada, Brazil, Japan, New Zealand, China, Israel, Hong Kong, Norway, Indonesia, Malaysia, Mexico, Singapore, South Korea, Switzerland, Taiwan, Thailand, Chile.